Mother's Day is always somewhat bittersweet for me. Yes, I'm a mom and it's my "special" day but it's also a huge reminder that I don't have my own mom with me anymore. And some years, like this one, it's a double-whammy with her birthday falling on the same day. She would have been 74 years old today. I lost her to cancer 9 years ago. It seems fitting the charity sewing project that my local guild is focusing on this month is Hearts for Hope, a small heart shaped pillow designed for women with breast cancer who have undergone some sort of breast surgery. It's often very painful to have a car seat belt on comfortably after a breast surgery so these pillows are placed onto the shoulder (via the adjustable strap) and provide a cushioning between the surgery site and the seatbelt. While it may not seem like much, the 30 minutes it took me to put it together made me feel closer to my mom today. Diana, I totally get the bittersweet aspect to this day as my mom has been gone for 19 years. Can it really be that long? 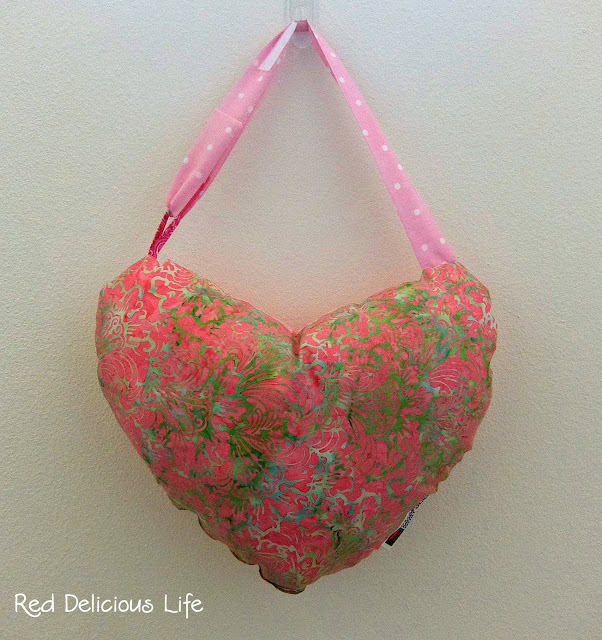 I love the Hearts for Hope pillow to help women who have had breast surgery be more comfortable. Thanks for sharing it. Take care, Mary. What a lovely project to work on and to remember your mom by. Happy Mothers Day Diana. so sorry for the loss of your mom. I know this loss is felt even more each mothers day. The pillow is very cute! Working on this pillow is such a wonderful way to honour your mother's memory. I am so sorry to hear that you lost your mom to cancer, Diana, and I am glad you were able to do some sewing that helped you connect with her. Sorry about your mom. This little pillow is cute, I wonder if our guild can do something like this. The little pillow is a great idea . Like yourself the uk Mother's Day is bittersweet . It was a long time before I actually enjoyed the day , I do now.